Alton Towers Resort has exclusively revealed changes to TowersTimes, that elements of the ride will differ from the plans originally submitted back in December 2011. The ride track itself is covered under a general planning permit so the resort does not need to resubmit the plans providing the buildings and additional structures within the area remain the same. 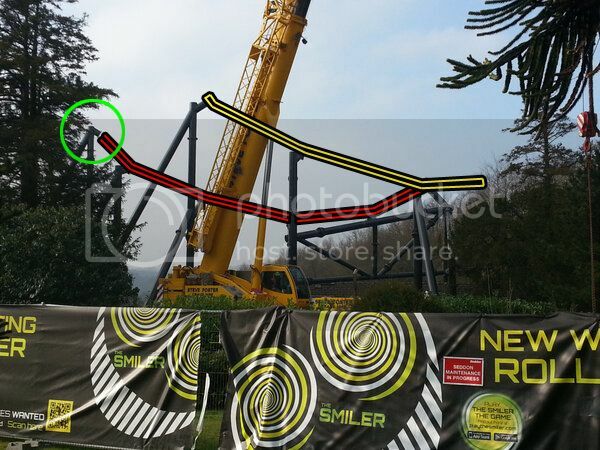 It also comes after a support after the first lifthill, has a down facing support (In the circle on the bellow picture), meaning that it is in the inversion position, which this was also never originally shown on the plans submitted back in December 2011. Hmm... That does look like an inversion. They are most probably going to have something like the Hulk in Universal Studios by the look of that support. Thekingin64 wrote: Hmm... That does look like an inversion. They are most probably going to have something like the Hulk in Universal Studios by the look of that support. Yeah that's probably what they are going for, but personally I have a bad feeling this will take away from one of the key elements The Swarm has (The Inverted Drop), I know it looks like it will be a different type of inversion but it will still lead into the drop. And also I fear they may take the record now for the most inversions away from Colossus too. Possibly. I'm still not sure it will be an inversion though. While it could be one, It still could be a very heavily banked overbank. Alton Towers have really surprised me with this news, a secret element is understandable, but a secret layout, that defiantly has been a 1st for Alton since the days of the internet. Definitely. I always had a niggling suspisicion that those original plans were fake anyway. First the inversion entrance into first drop seems to be happening and it looks like they've not got rid of the complete orginal layout, but have just amended it. That looks amazing! I am definitely trying to get my Dad to download that! I love the adaptation of the music.